evc = Embedded Visual C. Microsoft’s now freely available embedded Visual C 4.0 (and 3.0) Visual Studio 6 based development environment (IDE, compiler etc). 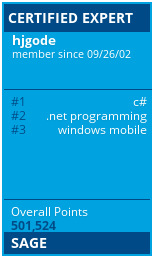 PPC = Pocket PC, changed to Windows Mobile starting with Mobile 2003. A device with touch screen (most 240 x 320 pixel) and at least 5 or so hardware buttons. Softkey = The keys invoking OS functions, in example F1 will be the same as VK_LWIN the Windows key. F3 is the left softkey which invokes the phone app. F6/F7 is used for Volume Up/Down. Stylus – used to ‘click’ on the device display. taskbar = on WMthis the bar at top of screen.